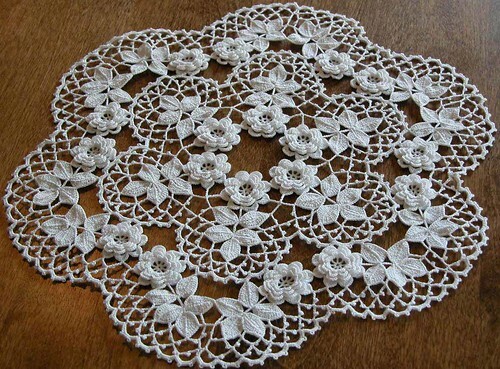 This little Irish crochet doily is one of my favorites. Not because of the design, which I adore, but because I received the pattern from an internet friend in Australia. I have since lost contact with her, but for a few months we emailed about our interest in Irish Crochet. She sent me this pattern and I sent her one that I had already made. We didn’t share the patterns over the internet, but exchanged them though regular mail. I like working from Japanese patterns since the stitches are drawn out in charts, which makes the patterns so easy to follow. This pattern is from a Coats company pamphlet, so it is written in crochet shorthand. The bottoms of the stems of the inner ring of flowers are supposed to curve to one side. The directions for doing that confused me and I just made up my own for that part. If I ever get around to making it again, I plan to curve those stems. This entry was posted on Saturday, November 1st, 2008 at 10:35 am and is filed under Crochet and Lace. Tagged: Crochet, Irish, Thread. You can feed this entry. You can leave a response, or trackback from your own site.